The Corvette lost a front wheel in the first crash but kept on going. Innocent bystanders getting caught up in high speed police chases is a depressingly common sight. 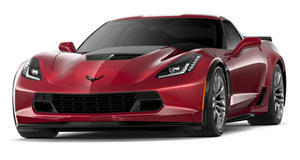 Omaha World Herald reports that police were chasing a 21-year-old suspect in a Chevrolet Corvette ZR1 which injured three people in two separate crashes during the high-speed pursuit. The chase began when the speeding Corvette passed a trooper on the West Dodge Expressway. As the trooper pulled behind the Corvette, the driver, Shaheer Atiqullah, “floored it,” reaching speeds of up to 132 mph. After exiting the expressway, the muscle car slammed into a van, sheering the driver’s side front wheel off as well as a “bounty of plastic parts.” Despite suffering severe damage, the Corvette was still drivable and the driver stubbornly continued to evade the police. As you can probably imagine, the wounded Corvette wouldn’t have been easy to control with a front wheel missing. Inevitably, it struck another vehicle, slamming into the back of a pickup towing a trailer for a lawn service. The occupants of the pickup suffered stiff necks and backs, but it was fortunate the Corvette hit the trailer full of lawn mowers which absorbed the brunt of the impact. “Much like crumple zones on your car, it took the force of the impact out of it,” one of the pursuing officers said. “Everybody in that Corvette would have been dead.” The driver and two female passengers in the Corvette were hurt and taken to the hospital where they were treated for non life-threatening injuries. Atiqullah's list of charges include felony flight to avoid arrest, willful reckless driving, speeding and driving with a suspended license. There was also already a warrant out for his arrest for willful reckless driving, driving under suspension and failure to appear in court.